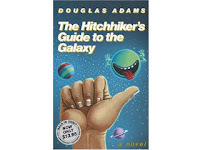 Nigel G. Mitchell - Author, Blogger, Geek: 10 Surprising Facts About "The Hitchhiker's Guide to the Galaxy"
10 Surprising Facts About "The Hitchhiker's Guide to the Galaxy"
Happy towel day! Every May 25 is Towel Day, the day fans celebrate the classic sci-fi comedy The Hitchhiker's Guide to the Galaxy. In honor of the occasion, here are ten weird but true facts about the novel and the series it spawned. 1. The Hitchhiker's Guide Has Conquered Almost Every Medium - The Hitchhiker's Guide to the Galaxy was originally written as a radio comedy, from which Adams adapted the first two novels. The novels were adapted into a TV mini-series, followed by a computer game, a comic book mini-series, and three more novels, which were in turn adapted into radio comedies. The original radio comedy was released on LP records, and also CDs. Then there was The Hitchhiker's Guide to the Galaxy movie. 2. How Do You Spell Hitchhiker - The spelling of the word "hitchhiker" has varied wildly throughout the publication of the series. It's been spelled "hitch-hiker," "hitch hiker," "hitchhiker," and any other way you can imagine. It's even been spelled differently on the same book - for example, having one spelling on the title, and another spelling on the spine, and another spelling in the actual manuscript. Finally in 2000, Adams announced that the word should always be spelled "hitchhiker." 3. The Story Evolved As He Wrote It - Douglas Adams wasn't working off an outline, but was literally making it up as he went along. As a result, the story takes a lot of twists and turns that Adams never intended or expected. In a way, the meandering quality adds to its charm. 4. Infinite Improbability - The most famous technology in the series, the Infinite Improbability Drive, was in fact a massive deus ex machina that Adams created to get himself out of a corner he'd written himself into. He had written an episode that ended with Ford and Arthur being shot in open space without spacesuits. He had no idea how to rescue them. It was ridiculously improbable that any spaceship would come along and rescue them in time, so Adams created the Infinite Improbability Drive to make it plausible. 5. The Ends of the Earth - Adams originally conceived the series that became "Hitchhiker's Guide to the Galaxy" as a series called "Ends of the Earth." Every episode would be about a different way the Earth is destroyed. The first episode would be about the Earth being demolished for a hyperspace bypass. He needed an alien who would know the demolition was coming, and came up with the idea of him being a researcher for the Hitchhiker's Guide to the Galaxy. In the process, he decided he liked the premise, and just made the show about the alien researcher and the Guide. 6. The Worst Poet in the World - In the Guide, Vogon poetry is described as the third worst poetry in the Universe. In almost all versions of the Guide series, the worst poetry in the Universe is written by Paula Nancy Milne Jennings. The original radio script had the poet's name as Paul Neil Milne Johnstone. Johnstone is, in fact, a real poet who went to Brentwood School with Adams and whose poetry is generally considered quite bad. Adams had to change the name to avoid libel suits. 7. Douglas Adams Hated the Cosmic Cutie - American fans of the Hitchhiker's series are familiar with the green smiling planet cartoon on the cover of every book in the series published in the US. It's known as the Cosmic Cutie, and was designed by the publishers to visually connect the books, because they were afraid readers wouldn't know they were part of the same series. Adams hated the character and demanded it be removed from future publications, but American readers have grown an attachment to it. 8. There is No Definitive Hitchhiker's Story - Every time the story was adapted for a new medium, Adams would make changes - adding or removing scenes, changing the sequence of events, and generally mucking things up. As a result, there is no "true" version of the story. 9. Surprise, You're A Success - Douglas Adams was more shocked than anyone else when his first novel became a success. When he went to his first book signing and saw the huge crowd, Adams thought at first that he was caught in some sort of demonstration. 10. I Put Off Writing This Until The Last Minute - Adams was a notorious procrastinator. He famously once said, "I love deadlines. I love the whooshing sound as they go by." The first novel ended abruptly because the publisher got so sick of waiting for him to finish it that they told him to just finish the page he was on, and they picked it up. On a few occasions, Adams had to be locked in a hotel room with his publisher to force him to finish his novels. He spent over ten years writing what was meant to be the final Hitchhiker's novel, The Salmon of Doubt. When he died, the world discovered he hadn't even produced a complete first draft.